Nik Sharma is a local DC-based food blogger who writes a brown table. His recipes try to keep the emphasis on simplicity and try to adapt Indian and other international cuisines. Nik’s work has been featured in the Huffington Post Taste, The Kitchn and Honest Cooking Magazine. If you have a recipe from PoPville please send an email to princeofpetworth(at)Gmail and include recipe in the subject line. Chocolate brownies make a great treat for the holiday season and this version is not only delicious but also simple. I’ve modified and adapted this brownie recipe from Alice Medrich’s Sinfully Easy Delicious Desserts. This is also my new favorite holiday dessert that I’ve made for myself and for others as gifts.What makes these brownies special are two things, the browned butter flavor and the delicious red wine. Each of these ingredients flavor the brownie and improve the taste of the cocoa. By browning the butter the brownies get a smooth and wonderful taste that I would describe as somewhere between a light butterscotch to nutty flavor, if that makes any sense. I used a Malbec for the red wine since it is a bit robust and intense in flavor but even a good quality Shiraz would be great here. To make your life easier and less messy, I recommend either buying pre-chopped walnuts or putting the shelled walnuts in a bag and then pounding them a little a rolling pin to coarsely chop them. Eventually most of the walnuts will get sliced once you cut your baked brownies into bite-sized squares. 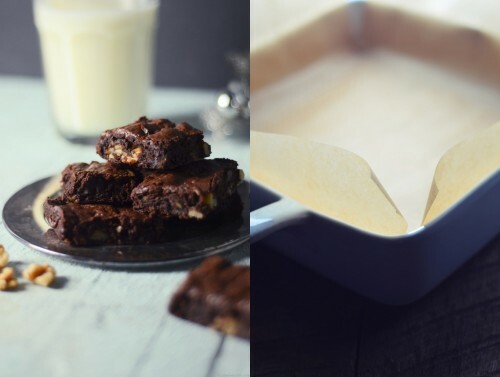 These brownies have a light and thin crust but also have a soft and creamy smooth interior. Enjoy immediately or store them in airtight container until needed! Claire writes the delicious food blog Sel et Sucre and is gonna share a bit of her magic with PoPville. I already post recipes on Sel et Sucre so here I’m going to focus on giving you formulas instead of recipes. What’s the difference? Recipes lay out exactly what to do for one particular version of one particular dish. Formulas, on the other hand, explain the general underlying principles and patterns so that you can easily come up with your own recipes. I like formulas; they’re what turn cooking from a chore into an enjoyable experience. In honor of the recent heatwaves, I’m going to write a little about agua frescas. The perfect refreshment on these blazingly hot days. Often strangely neon in color, these “fresh waters” are essentially diluted juices, with enough sweet and tart flavor to keep you wanting more. As someone with a compulsive need to provide guests with sustenance as soon as they step in the door (an inherited trait – thanks, Dad! ), I love having a pitcher of agua fresca around. Handing a guest a glass (or jar, as it often goes in my house) filled with this magical elixir on a hot summer afternoon is sure to elicit praise and thanks. So, let’s get on with it – what’s the formula? First, start with a base flavor, usually fruit, such as pineapple, melon, or cucumber (yes, cucumbers are a fruit). Less commonly used but still okay fruits include strawberries and peaches. 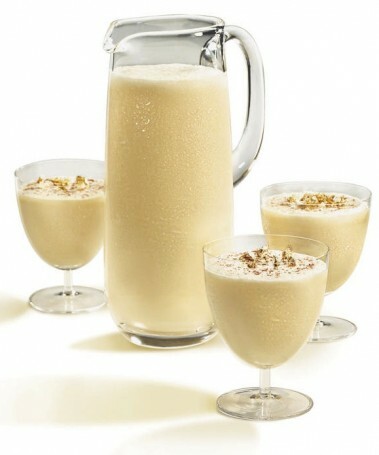 I wouldn’t recommend using bananas (instead, slice and freeze those, and create another favorite of mine – which I call a “banana milkshake” – by blending with milk, honey, and cinnamon) or tomatoes (although, like cucumbers, they are technically a fruit). Next, pick a secondary flavor, usually herbs or spices. I like to use whichever herb is reaching critical capacity in my garden. Basil, mint, and rosemary are great options. Ginger is also really good, or you can even toss in a chili pepper. Then, add a little citrus. Preferably fresh-squeezed (and tossing in a little zest won’t hurt). I typically go with lime, but lemon is also a good option. Orange juice often works, but be careful – sweeter base flavors really need the tartness of lemon or lime to balance them. Last, choose a sweetener. I most frequently use simple syrup (stir together equal parts sugar and water over low heat in a saucepan until dissolved), but plain sugar, honey, or agave syrup should all also work. Now that you have all your ingredients, use a blender or immersion blender (one of my favorite kitchen tools) to puree until smooth. You may need an extra couple splashes of water in order to blend. Don’t forget one of the most important steps – taste it! Then, adjust your ingredients and re-blend as needed, keeping in mind that you want a strong flavor here as you will be diluting it down the line. Take the resulting mash, and strain through a cheesecloth-lined strainer. This is what makes the resulting drink a refreshing, hydrating agua fresca instead of a smoothie. You can store this concentrated syrup in the refrigerator for a week or two until ready to use. When you’re ready for a nice drink, mix with still or sparkling water (usually you’ll want about twice as much water as syrup, but it’s easy to adjust to taste), and serve! You don’t have to follow this formula to a tee. Feel free to use a herb as your base flavor, omit the sweetener for a healthier version (works especially well with sweeter fruits like strawberries), or otherwise adapt this formula as you see fit. I have a Thai basil lime agua fresca recipe posted on my site, for example, that uses Thai basil as the base flavor and a hefty amount of lime as both the secondary flavor and citrus. Don’t be afraid to get creative! Soon you’ll be ready for the next heatwave. Vivi Mazarakis is the author of Forking DC. You can read her previous columns here. I turned to the web and my friend Google. I found several different recipes that called for various degrees of complexity. I decided to skip those that called for lightly dusting the spinach with flour and went for the more straightforward “drop plain spinach in hot oil” method. Below is my recipe for recreating this popular dish, which draws ingredients and techniques from several of the recipes I found. I must admit it came out pretty close to Rasika’s version. It’s good enough to satiate your craving when you just can’t get to the real thing. 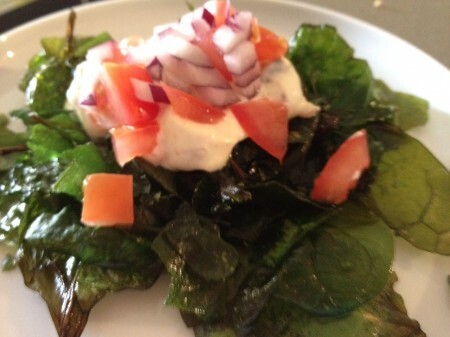 However, the truth is that frying spinach is a little tricky. It must be absolutely dry before dropping it in hot oil. Even with dry spinach, there is a significant amount of oil splatter because the oil is reacting to spinach’s naturally high water content. The process, even with my extreme caution, resulted in a few oil burns on the inside of my wrist. I think using a deep fryer is preferable because it does a better job containing oil splatter than a pan or Dutch oven. It’s that time of year. Valentine’s Day is less than a week away. If you haven’t made reservations already, what were you thinking??? Not to worry. You can always stay in and cook for that special someone. I know that cooking can be stressful for some, especially if you’re in a new relationship, have never cooked for your significant other before, or are unsure about your prowess in the . . . kitchen. I’ve put together a stress free Italian-themed meal that will address all the major concerns: it’s easy; it’s light, but satisfying; and it ends with a hit of espresso to keep your energy levels up. Start with an antipasti platter. There is no one recipe for this. Usually, it includes cheese, cured meats, and extras like vegetables, olives, and/or nuts. When I put a platter together, I like to choose two cheeses – one that is soft and gooey (e.g., brie) and one that is harder (e.g., manchego). I add two cured meats like salami and prosciutto. Instead of serving the prosciutto in a nice heaping mound, try this alternative: lightly dress some arugula with salt, olive oil and balsamic vinegar (note: I would use a 3-to-1 oil-to-vinegar ratio). Wrap a slice of prosciutto around a bite-size bunch of arugula and secure it with a toothpick. Make a little extra dressing to drizzle over the finished bundles. Finish off the platter with some crackers and olives or marinated artichoke hearts. 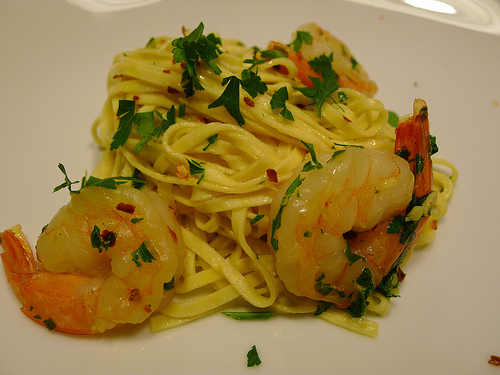 For the main course and dessert, I suggest shrimp scampi and affogato (recipes after the jump). Some of you may think that shrimp scampi is boring, but I love its simplicity and the contrast between the heat of the red pepper flakes and the brightness of the lemon and fresh parsley. Affogato, which literally means drowned in Italian, is simply hot espresso poured over ice cream or gelato and topped with whipped cream. This recipe was inspired by my recent trip to the Atlas District’s Toki Underground, a Taiwanese noodle and dumpling shop inspired by Japanese ramen houses. (Read my review of Toki here). Ever since slurping noodles there last weekend, I just couldn’t stop thinking about the Hakata Classic (ramen with pork loin). So, I turned to one of my favorite chefs, “Iron Chef” Masaharu Morimoto, and his book “The New Art of Japanese Cooking” to feed my obsession. Sitting on my couch, I leafed through the colorful images of Chef Morimoto’s beautifully plated food looking for a recipe I could try. When I came across Morimoto’s Za Jan Noodles recipe, I thought: bingo! 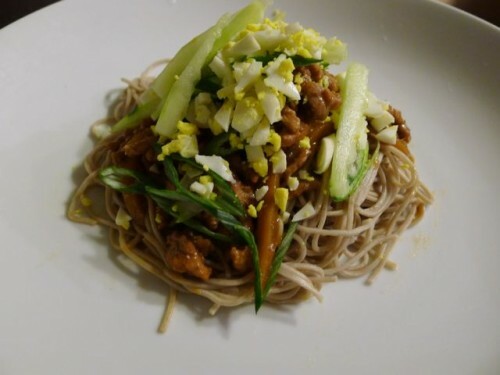 It would satiate my craving for both noodles and pork, and it seemed relatively easy to prepare. Below is my slightly modified version of this recipe. For vegetarians, swap out the pork with tofu and skip the egg. Tofu is a great substitute since it will soak up the flavor-packed sauce. Most of the ingredients can be found at your local grocery store. As for the red miso, you can find it and any other Asian specialty items at one of my favorite stores in DC – Hana Japanese Market at the corner of 17th & U St. NW. This place is a real gem and the owners are nice and very helpful. As for the sake, you’ll find that many liquor stores these days carry it. For example, you can find it at the liquor store across the street from Hana or De Vinos, a great wine store in Adams Morgan. Otherwise, cooking rice wine, which you can find at any grocery store, will work just fine. Born and raised in Texas, it wasn’t until I left the Lone Star State that I realized that some people make their chili with beans. Texas chili doesn’t bother with beans. Beans are for the weak. Texas chili is all beef. (Sorry, vegetarians.) When I was a kid, I remember looking forward to Go Texan Day (yes, that’s a real thing), and not because my mom insisted that I try to “fit in” by wearing a cowgirl outfit. I looked forward to the chili cook-off that was often a part of the Go Texan Day festivities. I didn’t compete in the cook-off. . . unless by competing one meant trying more cook-off entries than anyone else at school. I’ve always loved me some chili. People take their chili recipes seriously in Texas. Dare I say that chili cook-off competitors don’t consider it real chili unless the recipe calls for two or more complex spice “dumps” during the several hour-long cooking process. Having just concluded some serious family/holiday time in my home state, I find it all too proper to offer you my own chili recipe. My recipe is simple, but still rich in flavor. 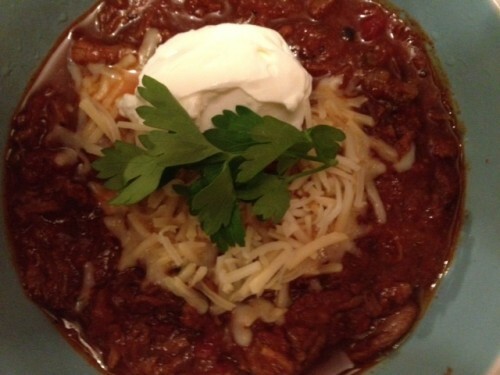 Whether it’s because you’ve never had Texas-style chili or because you want to take a break from your go-to chili recipe, I hope you try this recipe out for yourself. I made it for my family on Christmas Eve as a fitting prelude to the Greek-themed Christmas dinner we were to have the next day. Everyone loved it. Egg Nog literally means eggs inside a small cup. It is an English creation descended from a 17th century British drink of eggs, milk, and Ale, called Posset and first made in England’s East Anglia. From there it traveled well throughout the British Empire, and still further well beyond adapting to local tastes wherever it landed. In America, Bourbon replaced Ale, while in the Caribbean, Rum or Brandy are more commonly used. In Mexico, Egg Nog is called Rompope; in Cuba, Crème de Vie; in Puerto Rico, Coquito; in Peru, Pisco; in Germany, Eierpunsch; in Norway and Sweden it’s called Glug; in Poland, Korzenny; in Chile, Cola de Mono; in France, Lait de Poule; in Venezuela, Ponche de Crema; and in The Netherlands, Advocaat. I like to serve up in cups with a Cinnamon stick. Simply ignore today’s “Food Police” cries of high fat and cholestrol and enjoy this wonderful holiday libation ! –Life of London, Pierce Egan, 18th Century English Author. Sometimes edible gifts are the best. This holiday season, I’ve decided to give friends festive tins filled with three of my favorite cookies as gifts. 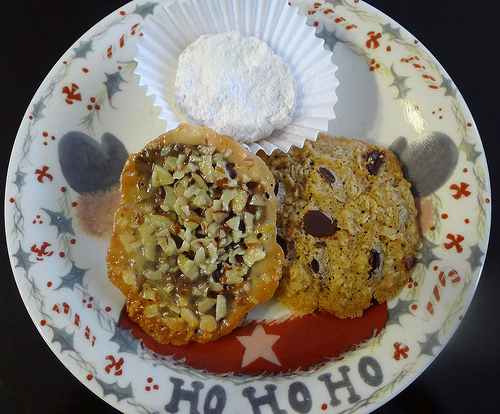 Below are recipes for Kourabiedes (traditional Greek cookies), Oatmeal Chocolate Chip cookies, and Florentines. Incorporate one or all of these cookie recipes into your holiday baking rotation and you won’t be disappointed! Pronounced “kou-ra-bee-yeh-thes,” these Greek cookies are traditionally made for Christmas and Easter. Simply put, they are buttery and doused in powdered sugar. Need I say more? Beat together the butter and powdered sugar until light and fluffy. Mix in the egg yolks. Add the orange juice, extracts, and brandy. Slowly mix in the flour (1/2 a cup at a time). Try not to overwork the dough. You’ve added enough flour when the dough tightens up, but is still a little wet. Add the almonds and mix to combine. Take about a tablespoon of the dough and form it into a ball. Place it on a lightly greased baking sheet and press down slightly. Repeat until you have used up all the dough. Bake for about 15 minutes or until a very light golden color. Eating tip: Don’t inhale too deeply when you bite into this cookie unless you like living on the edge. Inhaling will deliver a healthy sample of powdered sugar down your throat, which, in turn, will cause you to choke. That’s not a very merry experience. Otherwise, this cookie is delicious and safe to eat. Who doesn’t love an oatmeal chocolate chip cookie? 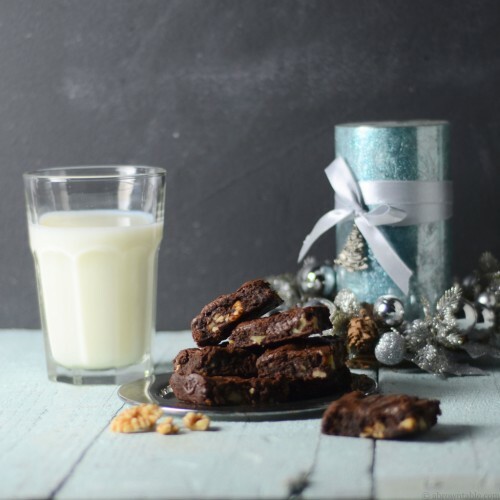 What I really like about this recipe is that the cookies come out chewy, rich and decadent, yet they’re a tad healthier than the traditional version. That’s because some of the butter is replaced with coconut oil and some of the all-purpose flour is replaced with whole-wheat flour. Add a little oatmeal to keep you “regular” and you have what I like to call a powerhouse oatmeal chocolate chip cookie. For those unfamiliar with coconut oil, it actually has a quite a few health benefits and can be found at Whole Foods and Harris Teeter. Vivi Mazarakis is the author of Forking DC. She previously wrote about Pumpkin Gingerbread Trifle with Bourbon-Maple Whipped Cream, here. Thanksgiving has come and gone, I’ve waded through Black Friday and Cyber Monday emails, and I still have leftover turkey in the fridge! There are only so many turkey sandwiches I can eat, so I turned to Italy for inspiration. The solution: ravioli. I know it sounds complicated, but it’s not. It’s so easy that I’m not writing out a structured recipe. After so much Thanksgiving planning and prepping, I think it’s nice to engage is some free-style cooking for a change. Below, I guide you through an easy way to make delicious ravioli. I used a food processor to blend equal parts turkey (white and dark meat) and corn dressing. Then I added a handful of grated Parmesan cheese, a dash of nutmeg, and a few slices of cranberry jelly (from a can, of course). For 12 ravioli, I only used a ½ cup of the corn dressing and 3 to 4 ounces of turkey. Vivi Mazarakis is the author of Forking DC. She previously wrote about Greek Chicken Soup here. With Thanksgiving Day only a week away, I’m reminded of a rather obscure “historical” fact. Did you know that at the first Thanksgiving the Pilgrims fought over cranberry sauce? In fact, the argument sadly divided the group into two camps: those that believed in homemade, chunky cranberry sauce versus those that insisted on cranberry jelly from a can. Because I like you, I’ll share with you a deep, dark secret. My foodie-self loves cranberry sauce from a can. Nothing makes me smile more on T-Day than seeing the gelatinous, cranberry-flavored cylinder slowly shimmy its way out of the can. Recently, I asked friends for their favorite T-day dishes. Sadly, no one said cranberry sauce from a can. I got some expected responses like macaroni and cheese, potatoes (mashed or gratin-style), sweet potatoes (casserole, candied, or with marshmallows), and dressing (in all its varied forms). I also received some unexpected ones as well. A vegetarian friend piped in with brussels sprouts made with smoked salt instead of bacon. Intriguing. 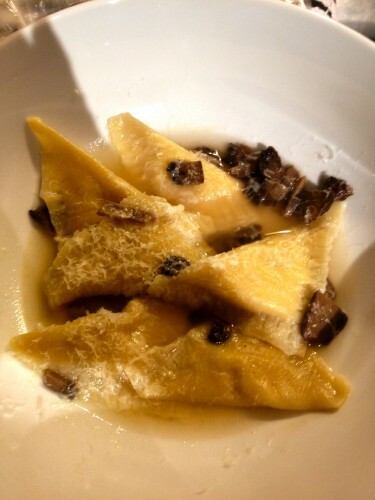 The funniest response came from a dear friend who offered up wine as her favorite dish. It’s funny cuz it’s true. The most unusual response was Jell-O. It came from a Utah friend that said it’s a “Utah thing.” Is it? Anyone want to pipe in on this? Sides dishes aside, today’s post focuses on dessert. I’m always looking for a good twist to the usual cast of T-day desserts. That’s precisely the reason I turned to my trifle bowl. I bought it many years ago at Marshall’s not really knowing what it was at the time — other than “on sale.” (To this day, its principal use in my home is a fruit and lemon bowl.) A few years ago – while watching the Food Network — a light bulb went off, and a trifle was born. Readers, I bring you my easy and delicious solution for T-day dessert this year! 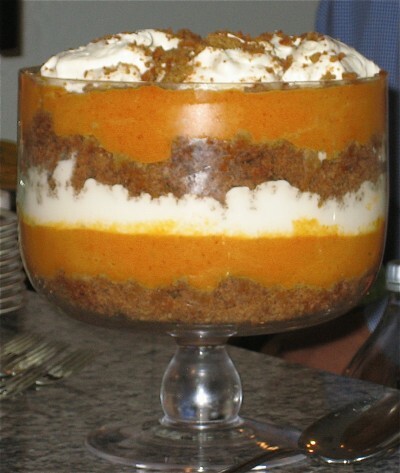 I call it Pumpkin Gingerbread Trifle with Bourbon-Maple Whipped Cream. The recipe is inspired by the queen of butter, the vixen of Southern cuisine, and the woman that was recently named Maxim’s Sexiest TV chef: Ms. Paula Deen. I’ve put my own twist on Deen’s recipe by tweaking the ingredients and adding homemade bourbon-maple whipped cream. You’re welcome. It can be made ahead. In fact, it should be made ahead in order to allow the flavors to fully develop. Trust me, this dessert will be a huge hit with your guests. My friends love it so much that they’ve requested that I make it again this year. If you don’t have a trifle bowl, don’t fret. You can use a punch bowl; a large, pretty serving bowl; or make individual servings in big wine glasses or sundae glassware. Part of the trifle’s charm comes from guests seeing the individual layers before diving in. Therefore, glass serving dishes work best.